Is indoor air quality testing really necessary? 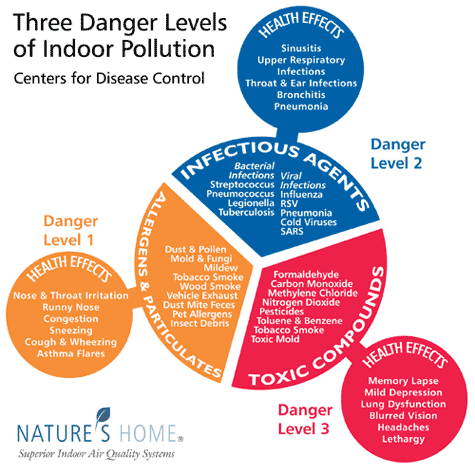 Does Indoor Air Quality matter? We all know by now that the quality of the air we breathe is a major factor on our health and environment. Poor indoor air quality can cause or contribute to the development of infections, lung cancer, and chronic lung diseases such as asthma. In addition, it can cause headaches, dry eyes, nasal congestion, nausea and fatigue. People who already have immune compromised conditions are at greater risk. The first step of defense against indoor air pollution is finding ways to keep the pollutants out of the air inside of our homes in the first place. This is sometimes referred to as source control. The lack of adequate ventilation, which results in a buildup of contaminants from sources within the home, affects the indoor air quality in a negative way. The National Institute for Occupational Safety and Health identified inadequate ventilation as the primary problem in more than half the workplace indoor air investigations it has conducted. Investigations conducted in homes by the Illinois Department of Public Health have found the same to be true. These investigations revealed that proper ventilation is important in maintaining good indoor air quality. Appropriate ventilation with clean fresh air can reduce the levels of indoor air pollutants. Most residential heating, ventilation, and air conditioning systems recirculate indoor air to conserve energy. The current trend in the construction of new homes is to reduce air leakage through cracks and other openings in walls, floors, and roofs. The combination of these construction practices and the recirculation of indoor air have led to an increase in indoor air problems. Finally, while air cleaning devices can be useful, they are no substitute for preventing the indoor air from getting dirty in the first place. Mold, bacteria, viruses, pollen, animal dander, dust mites, cockroaches and other possible insects or animals excrements. These may cause infections, provoke allergic symptoms or trigger asthma attacks. They are a major cause of lost days from work and school. Means of control include washing bedding frequently, keeping pests out, frequent cleaning and sanitization of all surfaces, keeping indoor dust to minimum and controlling moisture that promotes mold growth. We all know Smoke is a major indoor air pollutant. It contains some 200 known chemicals, such as formaldehyde and carbon monoxide, and at least 60 are known to cause cancer. According to the American Lung cancer Association every year it causes an estimated 3,000 lung cancer deaths and up to 50,000 heart disease deaths. In children, especially infants, it is responsible for pneumonia, lower respiratory tract infections and ear infections. It causes asthma to develop, causes asthma attacks, and makes attacks worse. Source control: No one should smoke. Combustion Pollutants come from sources such as fireplaces, furnaces, fuel burning stoves, heaters, and water heaters, using gas, oil, coal, wood, and other fuel source appliances. The most dangerous are both colorless and odorless gases like carbon monoxide and nitrogen dioxide. 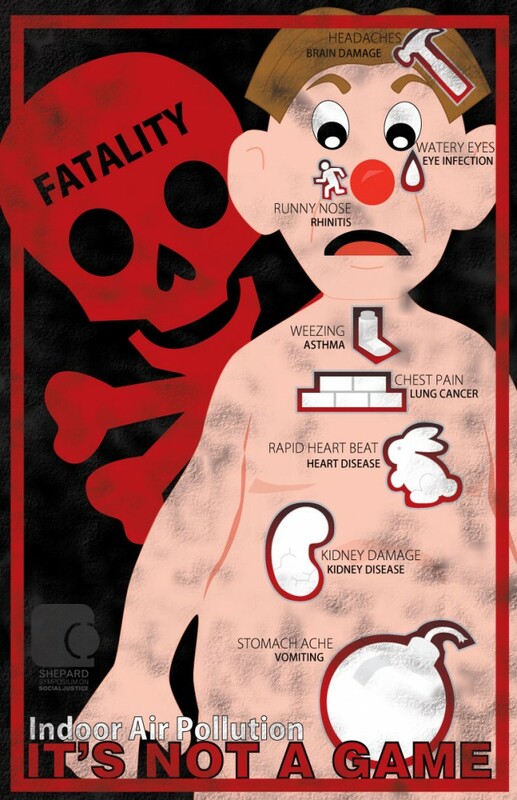 Carbon Monoxide interferes with the delivery of oxygen to the body and can produce fatigue, headache, confusion, nausea, and dizziness. Very high levels can cause death. Nitrogen dioxide irritates the mucous membranes in the eye, nose and throat and can cause shortness of breath and promote infections. Source control: The best way to control these pollutants is to make sure combustion appliances properly used are installed and maintained by reliable professionals and have monitors/leak detectors installed. 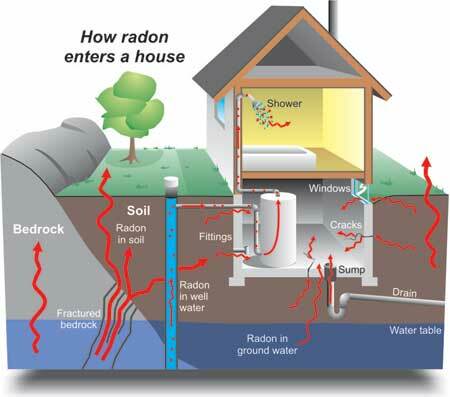 Radon, a naturally occurring radioactive gas that forms in the soil, most often can enter the home through the cracks in foundation floor, drains, and other sources. Indoor radon exposure is estimated to be the second leading cause of lung cancer in North America responsible for at least 21,000 lung cancer deaths each year. Steps to control radon include testing your home to ensure no radon is present and following recommendations for further testing and repairs if necessary. A non-flammable mineral that can release microscopic fibers, that when inhaled into the lungs can cause asbestosis, lung cancer and another cancer called mesothelioma. Many asbestos products are found in homes build before 1986, including roofing, flooring materials, and insulation for ceilings, walls, plumbing and heating equipment. Source control: if your house was built before 1986 get a designated substance report before any renovation or repair. A chemical, found primarily in adhesives, bonding agents for many materials found inside of our houses and offices, including carpets, upholstery, particle board, and plywood paneling. The release of formaldehyde into the air can cause health problems, such as: headaches, coughing, eye, nose, and throat irritation; skin rashes, and dizziness. Source control: avoid using products that emit formaldehyde. Thousands of potentially harmful chemicals are emitted by household cleaning agents, personal care products, pesticides, paints, hobby products, and solvents. They can cause dizziness, nausea, allergic reactions, eye, skin, respiratory tract irritation, and cancer. Minimize your use of such sources of dangerous chemicals, and be sure to follow manufacturer’s directions, including using protective equipment and adequate ventilation. Source control: find greener safer substitutes. Over 3 million Canadians cope with one of five serious respiratory diseases – asthma, chronic obstructive pulmonary disease (COPD), lung cancer, tuberculosis (TB), and cystic fibrosis. These and other respiratory diseases such as influenza, pneumonia, bronchiolitis, respiratory distress syndrome and sleep apnea affect individuals of all ages, cultures and backgrounds – from children to parents to grandparents. In 2013, lung cancer remains the leading cause of cancer death for both men and women. • 20,200 Canadians will die from lung cancer. This represents 27% of all cancer deaths in 2013. • 13,300 men will be diagnosed with lung cancer and 10,700 will die from it. 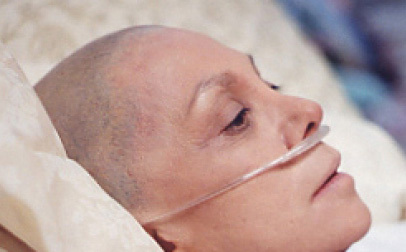 • 12,200 women will be diagnosed with lung cancer and 9,500 will die from it. • On average, 70 Canadians will be diagnosed with lung cancer every day. • On average, 55 Canadians will die from lung cancer every day. Find the post useful? Help others by sharing it! Contact us NOW to restore your peace of mind! Send us a message for an immediate response. Mildew vs Mold: What’s the Difference and When Should You Worry? Mold in the Home: Why is It So Dangerous? Here is a list of popular locations we serve. Call us if yours is not on the list! Our valued clients are our greatest form of advertising! In fact, most of our business come from referrals over the last 24 years. We guarantee your satisfaction!